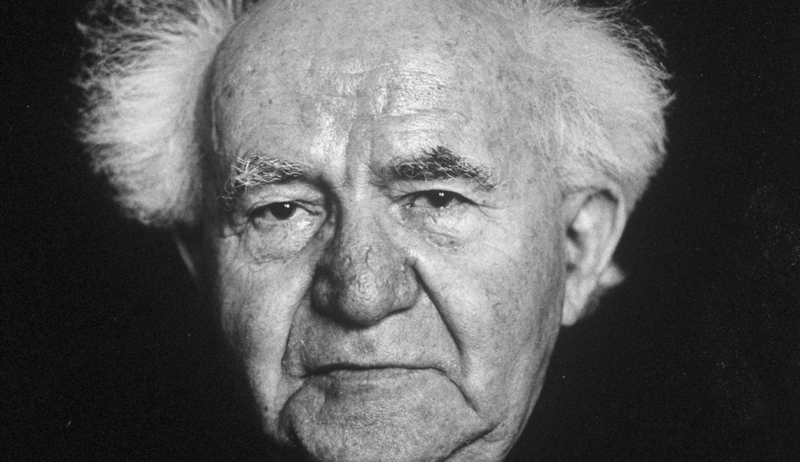 A portrait of David Ben-Gurion taken in the 1960s. Horst Tappe/Pix Inc./The LIFE Images Collection/Getty Images. Not surprisingly, this provided the theme for most of the press commentary about the film and for its reviews. “Ben-Gurion Favors West Bank Withdrawal in Footage from 1968,” proclaimed the headline of the Jewish Telegraphic Agency. Screen Daily went so far as to claim (erroneously) that he had predicated peace with the Arabs upon Israel’s withdrawal from “all of the territories” it conquered in 1967. But does it, really? It would be an elementary mistake to allow his “clear voice” circa 1968 to muffle his even clearer voice circa 1948, when he was at the height of his powers, both political and analytical. At Israel’s very birth, Ben-Gurion not only advocated territorial acquisition in war. He also fostered the conviction that Israel shouldn’t finalize its borders. Nor was this just a personal preference. Ben-Gurion put the issue to a vote of the yishuv’s leaders. If any vote may be said to have made the new state of Israel, it would be this one. It was closely contested—decided, indeed, by a margin of one. Unfortunately, beyond a small circle of Israeli historians, the details of this vote are little known—the reason being that 1948 was a year of war, and most histories of 1948 are military rather than political histories. (Both Dan Kurzman’s Genesis 1948 and Benny Morris’s 1948, for example, share the same subtitle, “The First Arab-Israeli War,” and both are decidedly military histories.) Then, too, there had been the very public November 1947 vote in the United Nations General Assembly for the partition of Palestine into two states, which had provided a spectacle of high drama before the cameras as well as much lore about behind-the-scene maneuvering. But while the UN vote licensed the creation of a Jewish state, the UN failed to act to implement its own decision. So it was the voting of the Zionist leaders themselves, behind closed doors, that was both crucial and decisive in the establishment of the state. The voting took place on May 12, 1948, three days before the end of the British mandate, in the People’s Administration, a kind of proto-cabinet. But here things become complicated. The standard story has it that a vote was held on whether to accept a truce in the fighting already raging between the Arabs and the Jews. That would have delayed the declaration of a state, perhaps indefinitely. Then a second vote was held on the question of the whether the new state should announce its borders. The UN partition plan included a map, but Israel’s founders decided that it wouldn’t bind them. Ben-Gurion came to regard this vote as one of his greatest political triumphs. As we shall see, the story of the first vote has almost entirely overshadowed the story of the second. Yet, as we shall also see, the evidence that the first vote even took place is questionable. Not so for the second vote, in which, by five to four, the founders deliberately declined to be bound by the map of the Jewish state that had been included in the UN partition plan, or to delineate any borders for the state at all. Ben-Gurion himself came to regard this latter vote as among his greatest political triumphs, and one he underlined time and time again. Let’s begin with a sketch of the background. Tucked in a residential side street near the Habimah Theater in Tel Aviv is the Jewish National Fund House. Built in the late 1930s in the Bauhaus style, for the last 30 years the structure has served as an educational center and museum. It doesn’t appear in most guidebooks because it’s open only to groups. Most Israelis and tourists who want to learn about Israel’s beginnings never visit it, instead finding their way to a building, now known as Independence Hall, on Rothschild Boulevard. There, on May 14, 1948, the cameras would record Ben-Gurion’s solemn declaration of the state and the festive signing ceremony. But before Israel could be proclaimed, it had to be born. That birth took place in the Jewish National Fund House. During the month prior to the state’s declaration, the building hosted the People’s Administration, the proto-cabinet, and the People’s Council, a kind of proto-parliament, both of them established by order of the Zionist Executive on April 12, 1948 in anticipation of the end of the mandate. It was exactly one month later, May 12, in a second-floor meeting room, that ten of the thirteen members of the People’s Administration met in a marathon session to decide upon a course of action. Those around the table that day had witnessed too much Jewish history. They had seen the population of the yishuv grow tenfold in 30 years—but had also seen the Jewish people in Europe almost totally destroyed in fewer than five. And in the past year alone, history’s wheel had started to turn again. In February 1947, Britain announced that it would be leaving Palestine, and then handed over the question of the country’s future to the United Nations. In November, the UN General Assembly, by a two-thirds majority, passed the partition resolution. Most of the yishuv rejoiced at November’s UN vote: since the time of Herzl, the creation of a Jewish state had been the dream and aim of political Zionism. Now it seemed within grasp. But Palestine’s Arabs, supported by Arabs elsewhere, rejected the resolution root and branch. From November onward, a civil war raged between Jews and Arabs even as the British prepared for their final departure, which they had set for the following May 15. As the Jews began to gird themselves for a great battle, many in the international community grew alarmed at the intensified violence. Their alarm grew when Arab states announced that they would come to the aid of the Palestinian Arabs once the British left. A regional war now seemed likely, and no one could be certain how it might end. And so, by the spring of 1948, some of the governments that had supported partition began to backtrack. By the spring of 1948, some governments that had supported the UN’s partition plan began to backtrack. The Jewish forces will initially have the advantage. However, as the Arabs gradually coordinate their war effort, the Jews will be forced to withdraw from isolated positions, and having been drawn into a war of attrition, will gradually be defeated. Unless they are able to obtain significant outside aid in terms of manpower and matériel, the Jews will be able to hold out no longer than two years. Right up to the eve of the British departure, therefore, the United States pressed the leaders of the yishuv, as well as its American Zionist supporters, to accept the trusteeship proposal, or at least the UN-sponsored truce. Most famously, on May 8, 1948, U.S. Secretary of State George Marshall, a skeptic on Jewish statehood, met in Washington with the shadow foreign minister of Israel, Moshe Shertok (later Sharett). Marshall began by acknowledging that the Jewish forces had won an initial string of victories—consolidating their hold on most of the territory allotted to the Jewish state and a few areas allotted to the Arab state as well—but dismissed this as but a “temporary success.” In the longer run, he warned Shertok, there was “no assurance” that fortune might not turn against the Jews. that they were taking a gamble. If the tide did turn adversely and they came running to us for help they should be placed clearly on notice now that there was no warrant to expect help from the United States, which had warned them of the grave risk which they were running. Marshall’s message came through loud and clear: postpone your state, and accept a truce. (The Americans spoke of a three-month cease-fire.) If you roll the dice, and you lose, don’t expect salvation from us. According to the lore that would surround 1948, warnings like Marshall’s plunged some leaders of the yishuv into doubt. After all, until now the yishuv had faced only Palestinian Arab militias. If the Zionists declared a state, they would face invasion by Arab states like Egypt, Transjordan, and Iraq, fielding conventional military forces armed and trained by the British over many years. The prospect of such all-out war was frightening, and here the Americans were proposing a truce; would it perhaps be sensible to accept it? 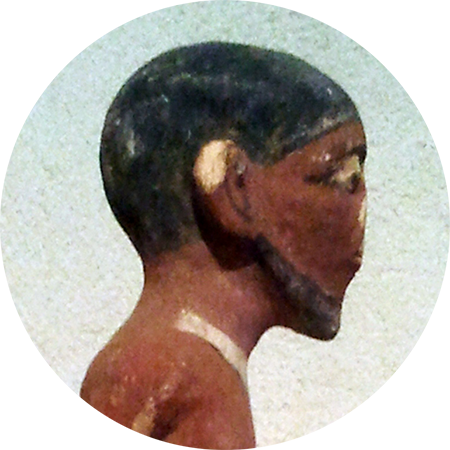 The most prominent waverer, according to lore, was Shertok himself. 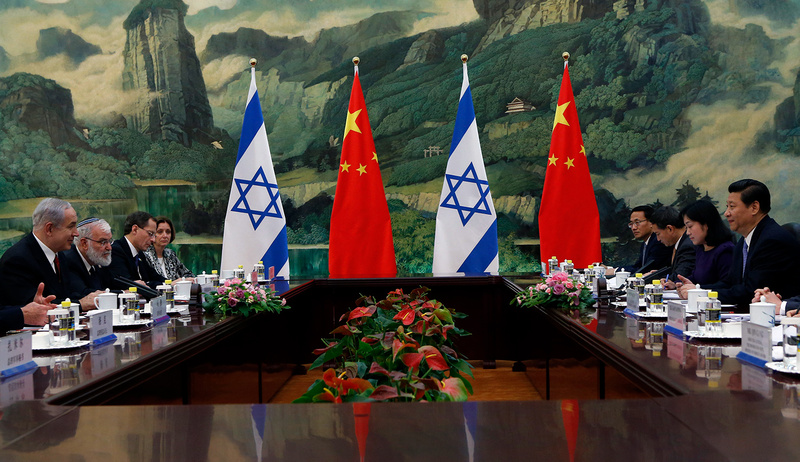 Marshall had made him doubt the wisdom of declaring the state—so it was said—and he’d arrived back in Tel Aviv on May 11, straight from Washington, opposed to such a declaration. But (the story goes on) the resolute Ben-Gurion practically abducted him from the airport on arrival, got him behind a locked door, and made him promise to keep his opinion to himself lest his flagging infect others. Did some yishuv leaders need to have their spines stiffened by a resolute Ben-Gurion? The story has an almost biblical ring to it. We stand on the threshold of fulfilling the hope of centuries, the culmination of an enterprise in which generations have sunk their efforts. This is within our grasp. For us to agree to any delay, without any certainty that this [state] would arise after the delay, would oblige us to stand in judgment before Jewish history, which we cannot do under any circumstances. . . . The process of territorial and functional taking-over was in full swing. Any leadership that tries to break this momentum would be swept from the stage. Upon his return home, Shertok saw it as his duty to report Marshall’s warnings to Ben-Gurion and his colleagues, both in the Mapai party and in the People’s Administration. But he also made it plain that Marshall hadn’t banged his fist on the table. In Shertok’s telling, Marshall had flashed Israel not a red light but a yellow one, while other, friendlier figures in Washington were flashing green. The sum effect of his messaging was not to exacerbate any doubts that other yishuv leaders might have had but to ease them. But this pertains to the much later history of Israeli political rivalries. What is important is that on the morning of May 12, 1948, when the members of the People’s Administration took their seats around the table, Ben-Gurion and Shertok were broadly aligned. What exactly happened in that thirteen-hour meeting? For the first 30 years after independence, the most thorough account was that prepared by a little-remembered man named Zeev Sharef. 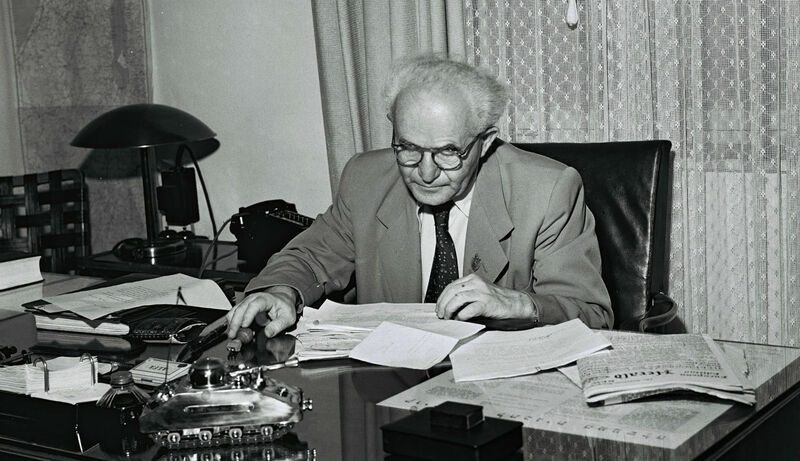 Regarded in his day as Israel’s “number-one civil servant,” Sharef had orchestrated the bureaucratic transition to statehood. He then served as Israel’s first cabinet secretary from 1948 to 1957, and from the 1960s as a cabinet minister, holding the portfolios of commerce and industry, housing, and (briefly) finance. He also implemented the first overhaul of Israel’s internal-revenue system. It was Sharef (with the help of two stenographers) who kept the minutes of the May 12 meeting of the People’s Administration. Later these minutes would serve him as a partial basis for a book on the birth of Israel entitled Three Days (1959; English translation 1962). Since, at the time, the classified minutes had not yet been released, the relevant chapters of Sharef’s book (in the section entitled “The First Day”) were long considered the insider source for the events of May 12. 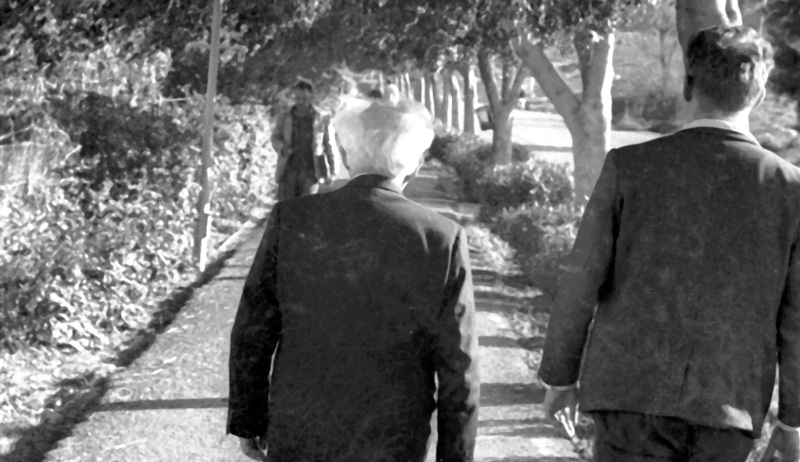 Those chapters (like the minutes themselves) are at times confusing, perhaps because, as Sharef writes, “neither the subject matter nor the agenda [of the meeting] had been determined in advance—[instead,] the agenda developed out of the proceedings” as the meeting, chaired by Ben-Gurion, wandered from subject to subject. But some of the major highlights as recounted in the book would become famous. Causing deep unease was the military briefing by Yigal Sukenik (later Yadin). As chief of military operations for the Haganah, and later to become the IDF’s chief of staff, Sukenik assessed that if the Arab armies invaded, “the chances are very much equal” (others would translate that to mean “50-50”). But, he continued, “if I am to be candid, the [enemy’s] advantage is large, if they bring all their fighting force to bear.” Ben-Gurion asked whether a truce would be advisable militarily; Sukenik said yes, it could be, but only if the time could be exploited to prepare for the next round. The situation of the Jews in besieged Jerusalem also prompted concern. Not only were they cut off (indeed, two members of the People’s Administration were unable to make it to the meeting in Tel Aviv), but the Transjordanian Arab Legion had laid siege to nearby Gush Etzion. In fact it would fall the next day, and its defenders would be massacred—the first decisive loss to an invading force. Sharef himself points to the meandering character of the discussion: “Actually, consideration of an epochal and fateful issue [of declaring the state] was interwoven into the discussion on [a cease-fire in] Jerusalem.” And “the question of whether to accept the American truce proposal at the UN was intercalated into the discussion on the creation of the state.” Every issue, when raised, seemed to bleed into another one, over which opinions divided differently. “A vote was taken. It was decided by six to four to reject the proposal for a truce.” This is the account that went down in history. A vote was taken. It was decided by six to four to reject the proposal for a truce. Acceptance would imply postponing the declaration of the state. Rejection, by the raising of hands, meant ipso facto that in two days’ time the state would come into formal being, within the comity of nations. And this is the account that went down “in history” as the standard version. Over the decades, Israelis would encounter it in a vast array of canonical sources, from the authorized account of the 1948 war, Sefer Toldot Ha-haganah (The History of the Haganah, part 3), to the 1981 documentary film series Amud Ha-esh (Pillar of Fire, episode 19). Ben-Gurion’s biographers, most notably Michael Bar-Zohar, Dan Kurzman, and Shabtai Teveth, also told the same story, with various degrees of embellishment. This was Ben-Gurion’s finest hour. Four of the ten didn’t budge from their opposition to the declaration (including two from Mapai, his own party), but he persuaded the other five, who had either wavered or opposed the declaration, and they backed his position. Now there were six supporters against four opponents. The American proposal was rejected. Ben-Gurion thus won this “dramatic vote, perhaps the most important in our history,” and he won it alone. “And now we will vote on whether to accept the armistice proposal,” Ben-Gurion declared. Had he made them understand? Could they hear the whispers of the fainthearted millions who had perished? . . . When the vote was taken, Ben-Gurion announced the result with the same calm he might have shown in setting the date for the next meeting. Six of the ten council members present had voted to reject the truce plan. Ben-Gurion glanced with the faintest smile at Shertok, who had cast the deciding vote. A state would be proclaimed. Transfixed by the magnetic personality of their chief, the other leaders fell silent. . . . At his call for those in favor of accepting the truce, Ben-Gurion saw four hands go up. The motion had failed by just one vote. On that one vote had hung the rebirth of the Jewish state. The discussion was protracted. . . . In the end the decision was six to four to declare statehood, with Ben-Gurion putting all his weight behind it. The council members were taking a tremendous gamble. Ben-Gurion . . . adamantly opposed any delay. . . . Yet some members of the yishuv’s leadership disagreed. . . . Ben-Gurion insisted that for Jewish sovereignty it might be “now or never” . . . By a slim margin of 6-4, the People’s Administration voted in Tel Aviv on May 12, 1948, to declare the first sovereign Jewish state since Judea had fallen two millennia earlier. And this is just a sampling; the story has been endlessly repeated because its drama is simply irresistible. Indeed, it is a modern iteration of the story of Exodus, with Ben-Gurion in the role of Moses, prodding doubters to believe in themselves and defy the dangers on the route to freedom in their own land. It was decided to declare statehood and a Provisional Government at four in the afternoon on Friday. Only [Peretz] Bernstein [of the General Zionists] suggested that we just declare the [Provisional] Government. I am not familiar with this at all, and in the minutes in my possession there is no such resolution, and I do not know on what basis you believe that six voted against it and four in favor. Therefore I cannot tell you the names of those against and those in favor, because there was no vote. Naor did not publish this letter until many years later. Then, in 1971, the multi-volume Encyclopedia Judaica appeared, and it included an entry on the “Israel Declaration of Independence” written by none other than Ben-Gurion himself. Once more, Ben-Gurion made no mention of any truce vote. But, as also in his reply to Naor, he did confirm the later vote, in which it was decided to exclude from the declaration any mention of borders. The most important piece of evidence appeared five years later. In his letter to Naor, Ben-Gurion had mentioned “the minutes in my possession.” These classified minutes were finally published on Israel’s 30th anniversary in 1978, after Ben-Gurion’s death. It turned out that he was right about them: the six-to-four vote against the truce (and, by implication, in favor of declaring the state immediately) is nowhere to be found; only the later vote, on whether to specify the state’s borders, is recorded in the minutes. Of course, much of what was said during thirteen hours of deliberations could not have been reported in only 119 pages of typed minutes. Sharef included what he thought was important. But even if some arguments fell by the editorial wayside, how could the vote over postponement have been omitted—especially since the same minutes duly recorded the details of the other vote? Publication of the minutes thus planted a seed of doubt. Some historians nevertheless decided to prefer Sharef’s book of 1959 to the minutes composed by him in 1948. After all, when he published his book, eight of the ten participants were still alive, some even active in politics, and Sharef himself was still a civil servant. Would he have dared to risk his position by fabricating the story of a split vote if there had been none? Also, some participants—notably, Mordechai Bentov and Aharon Zisling (both of Mapam, a socialist party to the left of Ben-Gurion’s Mapai)—reassured historians that there had indeed been such a vote. If so, then perhaps Sharef had simply struck it from the minutes because Ben-Gurion, eyeing posterity, wanted to minimize the depth of internal divisions. This speculation, presuming a sort of soft conspiracy, allowed historians to continue telling the story as they always had. But seeds of doubt have a way of germinating. An early dissenting voice was that of the military historian Meir Pa’il in his 1983 contribution to the monumental Historiah shel Eretz-Israel (History of the Land of Israel, volume 10). There he wrote that the People’s Administration “reached a general agreement, without a vote, to declare an independent state upon the British evacuation” (emphasis added). “Sharef was astonished and at a loss when he examined the minutes and discovered he had erred,” wrote an Israeli historian who confronted him. Contrary to the accepted version, there was no vote on whether or not to declare political independence. The only question on which the members voted was whether to define the borders of the state according to the [UN] partition plan. By a majority of five to four, it was decided not to include the matter of the borders in the declaration. Later, in 2005, the historian Yigal Eilam (who had been a consultant for T’kumah) published a detailed article aggressively accusing some historians of “laziness” in accepting the “myth” of the dramatic vote. He, too, tried to explain why the “myth” arose—his theory: Sharef became confused—and why the vote wasn’t necessary in the first place. Naor later assumed the task of preparing an authoritative account of the declaration co-sponsored by Independence Hall. Published in 2014, and promoted on the official website of Independence Hall in both Hebrew and English, it includes a facsimile of Ben-Gurion’s letter along with Naor’s reiterated view that the vote never took place. It might be asked: why didn’t the vote on declaring statehood take place? The answer: by May 12, the day of the People’s Administration meeting, there was no decision left to make. The Zionist Executive Council, the highest body of the world Zionist movement, declares today its decision to establish in the country the high authority of our political independence. . . . Immediately upon the end of the mandate, and no later than May 16, there will come into being a Jewish provisional government. All in the room knew that if they didn’t declare the state, someone else would: Menachem Begin. Second, all in the room knew that if they didn’t declare the state, someone else would. In his book, Sharef noted the sense around the table that “any deferment might provoke internal dissension, which would be likely to impair the yishuv’s combative mood and the morale of its troops.” This “internal dissension” had an unspoken name: Menachem Begin, leader of the Irgun, who had promised to declare a state if the People’s Administration didn’t. If I thought a truce was realistic, I’d be ready to consider it. . . . But there is no force that can guarantee it. . . . Who can promise and what guarantee could be given that the truce won’t be violated? . . . If the neighboring countries have decided to invade, they won’t stop just because we cancel the declaration. Neither the English nor the Americans have the power to prevent this [invasion], if it is as imminent as they think. . . . And if we now say that while yesterday we wanted the state but today we say there is no declaration and there is a truce, this will be an additional rationale for [the Arab states] to invade. The Jews are now united as never before. The splits of the past (and there were such splits) will widen, not narrow, if we wait. When we are at war, the splits diminish. . . . We are at the pinnacle of the ascent, beyond which there is no further ascent, only descent. We are liable to exhaust this force, and then we won’t benefit from its full power. Besides, how could the yishuv’s leaders hesitate when, as Shertok informed the meeting, even the cautious Chaim Weizmann was clamoring for statehood “now or never”? There was no other real alternative course. It seemed that the narrow path on which we trod hadn’t been chosen by us of our own free will, but was imposed upon us by hidden forces, over which we had no influence. Instead of a vote, the participants drifted into a legalistic discussion of whether to declare a “state” or a “government.” It was a distinction without much of a difference, and the consensus (Sharef called it a “tacit agreement”) settled on the state. There will always be a margin of uncertainty about the proceedings of May 12, but the truth probably most closely conforms to the description given by Shertok in his autobiographical anthology B’sha’ar Ha-ummot (“At the Gate of Nations,” 1956): “The decision to declare independence on Friday May 14, 1948 was taken unanimously in the session of the People’s Administration on May 12” (emphasis added). Will it ever be remembered mostly as Shertok described it? That still seems unlikely. The persistence of the more dramatic story of a split vote rests on its emotional appeal. But that is unfortunate. 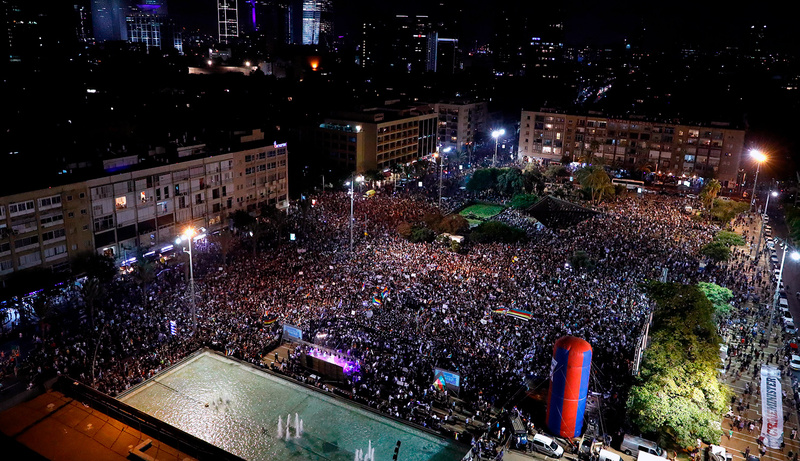 For one thing, by elevating Ben-Gurion to the stature of a Moses leading a fear-struck flock, it downplays the grit and fortitude of the 600,000-strong yishuv, which was steeling itself precisely for just such a day. For another, the legend of the split vote occludes the reality of the vote that did take place—and that exercised a lasting impact on Israel’s future. The real choice the People’s Administration faced wasn’t whether to declare a state, but what sort of state to declare. Would it be a state within the borders of the UN partition plan of the previous November? Or would it be a state whose borders would be determined by the fortunes of war? in accordance with the United Nations settlement. We didn’t think that settlement very fair since we knew that our work here deserved a greater assignment of land. We didn’t, however, press the point and prepared to abide scrupulously to the international ruling come the day of our independence. Over the following months, even as international support for implementation of the UN plan eroded, Zionists clung to it all the more tenaciously. It was their anchor against the shifting currents of policy in Washington, London, and Moscow. As the mandate wound down, Zionists insisted that, to the extent possible in light of Arab rejection, the plan be honored to the letter. So when the May 12 meeting took up the content of the declaration, there arose this question: what sort of reference should be made to the UN partition plan? Having insisted that others hew to the plan, could the Zionist movement do otherwise? Would, for instance, the Jewish state be declared “in the framework” of the plan? That would be the most legitimate form, and the one likeliest to win international recognition for the new state. But it also posed a dilemma. On the one hand, a declaration of total adherence to the UN plan would imply acceptance of its map; on the other hand, a declaration that the state was established only “on the basis” of the UN partition plan would imply a diminished commitment to that map. The dilemma was acute because in the intervening fighting the Jews had already occupied some territory, mostly to relieve isolated and besieged settlements, that the UN plan had assigned to the proposed Arab state. Should the Jews seek to reassure the international community that they weren’t bent on expansion? Or should they prepare the case for possible annexation? The Berlin-born Felix Rosenblueth (later Pinhas Rosen) was a member of the People’s Administration (New Aliyah party). A jurist, he would later become Israel’s first minister of justice, a portfolio he would hold three times. Some weeks earlier, he had assumed responsibility for drafting a declaration of statehood. Regarding borders, I agree with Rosenblueth. It’s not credible to declare an authority without defining its scope. This can draw us into complications. . . . What the state publishes is the law in the territory of the state. . . . When a state arises, it declares the limits of its borders. This is a declaration of independence. For example, there is the American Declaration of Independence. It includes no mention of territorial definitions. There is no need and no law such as that. I, too, learned from law books that a state is made up of territory and population. Every state has borders. [But] we are talking about a declaration [of independence], and whether borders must or mustn’t be mentioned. I say, there’s no law such as that. In a declaration establishing a state, there is no need to specify the territory of the state. Why not mention [borders]? Because we don’t know [what will happen]. If the UN stands its ground, we won’t fight the UN. But if the UN doesn’t act, and [the Arabs] wage war against us and we thwart them, and we then take the western Galilee and both sides of the corridor to Jerusalem, all this will become part of the state, if we have sufficient force. Why commit ourselves? Why did Ben-Gurion call for a vote? It’s a matter of conjecture. Clearly he thought the issue was of cardinal importance. He probably also thought he had to break the momentum built by Rosenblueth, a formidable legal authority. And it wasn’t just Rosenblueth: the Jewish Agency had consistently reassured foreign governments that the new state wouldn’t deviate from the partition map. As the U.S. consul in Jerusalem reported the following day, May 13, “Jewish Agency officials have steadfastly maintained their intention to remain within the UN boundaries.” If this “intention” were to make its way into Israel’s foundational document, it would be impossible to amend it later. Where exactly might the Jewish state seek to amend the borders stipulated by the partition plan? Ben-Gurion mentioned inclusion of the Jerusalem corridor and the western Galilee, but these were only two examples. In later years, in recalling his rationale, he would emphasize its more general character: “I said: let’s assume that during a war we capture Jaffa, Ramleh, Lydda, the Jerusalem corridor, and the western Galilee, and that we want to hold onto them. Well, it just so happens that we did take these places!” Ben-Gurion wanted the vote as a license to incorporate any strategically vital territory seized in war with an Arab aggressor. The May 12 decision thus set Israel on course to replace the partition map with another map. And the vote was an achievement in which Ben-Gurion took pride. He never claimed credit for turning the tide in favor of independence, but he would consistently claim credit for the vote on the borders. And in the telling, he would always make sure to mention that while his own law studies had been aborted by war in 1914, he had prevailed over the jurist Rosenblueth and the judge Sheetrit. It was as though he wanted to show that by his superior foresight and legal reasoning he’d saved Israel from being forever trapped in the partition map—by its own top lawyers. 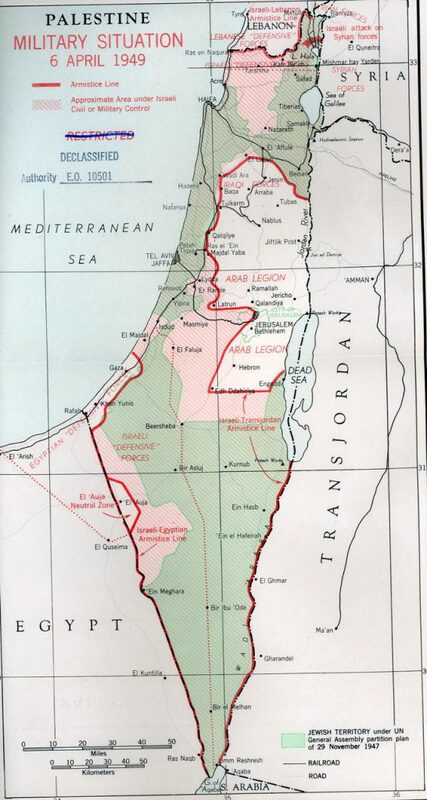 A map of Palestine in 1949 showing, in green, the territory allotted to the Jewish state under the 1947 UN partition plan and, in pink, additional areas won by Israel in its War of Independence. 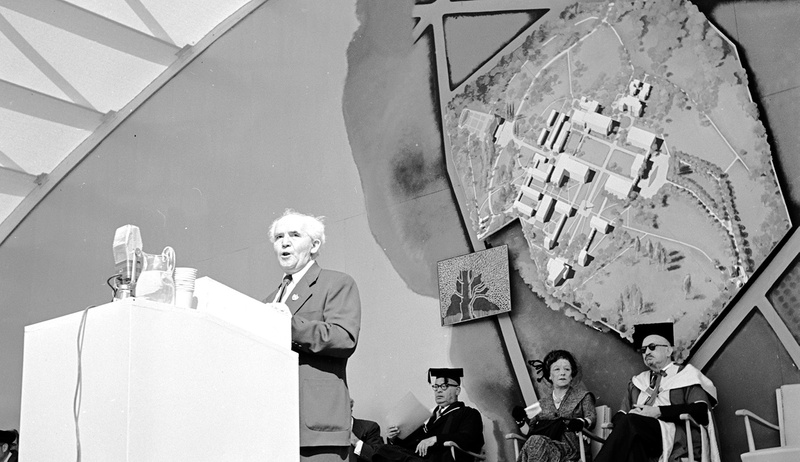 In the early afternoon of May 14, Ben-Gurion presented the final draft of the declaration of statehood for approval by the People’s Council, the precursor of the Knesset, meeting in the same Tel Aviv headquarters of the Jewish National Fund. Mention of the partition borders had disappeared from the draft. But the decision to omit them had been carried by a narrow vote, and there was some chance that the issue might become a bone of contention in the larger body. There was a proposal [in the People’s Adminstration] to determine borders. And there was opposition to this proposal. We decided to sidestep this question (I use this word deliberately), for a simple reason: if the UN upholds its resolutions and commitments and keeps the peace and prevents bombing and implements its resolution forcefully—we, for our part (and I speak on behalf of the entire people), will respect all of its resolutions. Until now, the UN hasn’t done so, and the matter has fallen to us. Therefore, not everything obligates us, and we left this issue open. We didn’t say “No to the UN borders,” but we also didn’t say the opposite. We left the question open to developments. This was a masterstroke of wording. The question of whether to commit to the partition borders in the declaration hadn’t been sidestepped at all. It had been decided by a vote. But the vote itself substituted ambiguity for certainty. Until May 12, the state-in-waiting had been committed to the partition map. After May 12, that commitment depended on the UN doing something it should have done, but hadn’t done, and likely wouldn’t do. Ben-Gurion had created a new consensus—“of the entire people”—that the partition map might be revised. Ben-Gurion had created a new consensus—“of the entire people”—that the partition map might be revised. The members of the People’s Council passed the draft declaration of statehood on the first ballot by a large majority, and on the second ballot unanimously. They then rushed to the Tel Aviv Museum (today, Independence Hall), where Ben-Gurion proclaimed the state of Israel. There is an American footnote to this story. The world had been led to expect that Israel would fill only the space on the map allotted to it by the partition plan. Washington was no exception; as Jewish statehood drew near, the U.S. government sought reassurances. On May 13, the Jewish Agency’s “ambassador” to Washington, Eliahu Epstein (later Eilat), received a phone call from Clark Clifford, special counsel to President Truman and a keen supporter of Zionism. 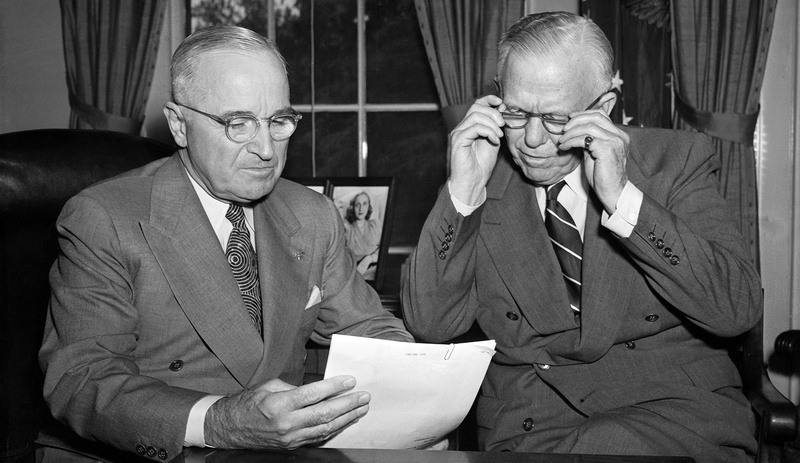 Clifford was working to persuade Truman to recognize the Jewish state immediately upon its birth. He instructed Epstein to write formally to Truman and ask for U.S. recognition as soon as the state was declared. In replying to Henderson, Epstein, who probably hadn’t heard Ben-Gurion’s new formula, adhered to the previous policy line of the Jewish Agency: unconditional acceptance of the UN map. Similarly, in his letter to Truman seeking recognition, he informed the president that Israel had been declared “within frontiers approved by the [UN] General Assembly.” Washington’s de-facto recognition of Israel followed almost immediately. In reality, the state of Israel hadn’t been declared in any borders, giving its critics a basis for later claims that the United States had been misled into recognizing the state based on a false representation. But who could blame Epstein for not knowing that Ben-Gurion had shifted Israel’s position at the last moment? Amid the political and practical preparations for the declaration, Tel Aviv was in turmoil and Epstein had no contact with Shertok, his superior—to whom he would apologize that same day for writing to Truman on his own accord. Ben-Gurion hoped that the partition map would be revised by Israeli victories; Loy Henderson and others hoped it would be redrawn by Israeli defeats. It was Ben-Gurion who would be vindicated. But on May 14 the United States hadn’t recognized Israel’s borders, either. It simply “recognize[d] the provisional government as the de-facto authority of the new state of Israel.” That formula actually consoled some, like Henderson, who opposed American recognition altogether. They could now hope that the Jewish state, following invasion by Arab armies, might be reduced to narrower borders than those of the partition plan, especially in the Negev. If the Arabs took Jewish territory—well, so be it: the United States hadn’t recognized Israel’s borders and certainly wouldn’t guarantee them. So while Ben-Gurion hoped that the partition map would be revised by Israeli victories, Henderson and his kind hoped it would be redrawn by Israeli defeats. Ambiguity in [independence] proclamation regarding frontiers much commented [by] delegations and exploited [by] opponents, possibly delaying recognition and restricting those received. We urge official statement defining frontiers [of] Israel in accordance with November [1947 UN] resolution. We began with the Ben-Gurion of 1968 who, in his old age, suggested that Israel could withdraw from territory it had conquered in June 1967 in return for “peace,” and who has posthumously become celebrated as a champion of territorial compromise. By now it should be clear that this image ill suits him. Recall: it was Ben-Gurion who, in 1948, first set Israel on the course of annexing strategically vital territory occupied in a defensive war. The places that Israel occupied beyond its partition allotment, and which Ben-Gurion (as we saw) would list with such pride, constituted almost a quarter of the country. Only under immense external pressure did he withdraw from a single conquest: the northeastern corner of the Sinai, in 1949. West of the Jordan, he never backed down, or out. True, he may have refrained (or, more accurately, been restrained) from taking even more territory that, at least in the estimate of his generals, Israeli forces could have occupied in late 1948 and early 1949. But territory, once occupied, never slipped from his grip. In short, his recent transformation strains against history. Sharef summarized the significance of the May 12 session in this way: “If the state were to be brought into existence by force of arms, then its putative frontiers would have to be determined by the same means.” And this: the state of Israel “would rule over that part of Palestine which was to be conquered by the prowess of the sons and daughters of Israel.” That position became inscribed in Israel’s declaration of statehood, not in words but in their absence—an omission effected by Ben-Gurion himself and validated by a crucial if narrow vote. Once we dispense with the story of the vote that didn’t happen, and focus on the vote that did, May 12 emerges as a microcosm of the modern history of Israel. This is Ben-Gurion’s record. Whether it should be considered all or part of his legacy is a matter of political preference. But, one way or another, this year’s 70th anniversary of Israel’s independence invites a reappraisal of May 12, 1948. Once we dispense with the story of the vote that didn’t happen, and focus on the vote that did, May 12 emerges as a microcosm of the modern history of Israel. Israeli Jews have been virtually unanimous in their zeal for sovereignty and independence. It’s never been a question, and it’s needed no affirmation by vote. By contrast, the territorial extent of the state has always been a question, and one that divides Israel almost down the middle. It can be resolved only by a democratic process. That process was inaugurated by the vote on May 12 seven decades ago, and continues to this day. How David Ben-Gurion Felt about the Size of the "Tablecloth"